trying to make my dome light and map lights led boards cleaner. they are done and on the truck but i have a cnc so i have to step my pcb board game up. after figuring out eagle cad. that took 5 hours, and ugs took 45 min to get it to move the cnc. first try just drew circles. 2nd attempt my bit broke. so i tryed with my smallest tip bit and it was way to large. carving liner is the name. (no clue what it is used for) its 5/8 point length and the finest point they had at woodcraft. 3rd one in the bit change even rezeroing then lowering and zeroring again it was off by 1/8th. final(for now) had to re-drill all holes by hand. how would one change from one bit to the next without it being offset. if i have to use the drill press to drill holes for the other 3 i will but would like to figure this out. just because it should do it. Have also tried generic 30deg v-bits which work well but havent spent the time in Eagle/CAM to nail that down yet. For me in my area. I cant get many v bits unless i drive 2 hours and pay 50 a bit. Home depo lowes ace harborfreight and all hoby shops dont carry many bit choices. All hand non cnc, round overs and patterned cuts with a table or ones with the guide bearings. its why when i seen the one i did i bought it. Other then that its 1/8 inch. I need to order anything smaller. 1/8 would make it so ihve to pool the solder. I do have a 1/8 bit and a 1/8 collet adaptor. And a metal lathe i was debating on figuring out how to make my own bit like i do for my wood lathe. But that is smaller then i think i can get squared up right. I have eagle down well enough for what i would want. Besides drawing the board shape beyond a box. I did try the pcb drilling bit set i bought to carve the tracing. It snapped 3 seconds into cutting the circles attempt. I am sure im over tuinking something. Or trying to get to much with what i have. 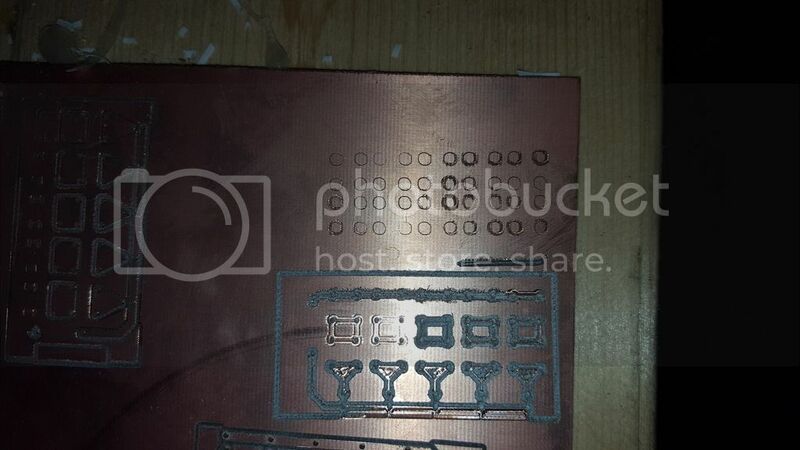 But next week i might buy a pcb set from here that has the carving/drilling set. In st pete fl. Its more of a retirement town then anything else. I do alot of amazon prime but i am dyslexic. I copy/paste alot. And havent seen someone say pn or anything besides pcb bits. I will look tonight. The adaptor was the only one i found that said it would fit the 611 router. I planned on using it 20 timea total when i bought it. I do alot of signs and cutting shapes i dont feel like freehanding. I will search for the v bits And see what i fine. Will they drill the hole also? If i could get away with 1 bit for everything it would be so much less i have to remember to do for this project. Can you get them off of Ebay? 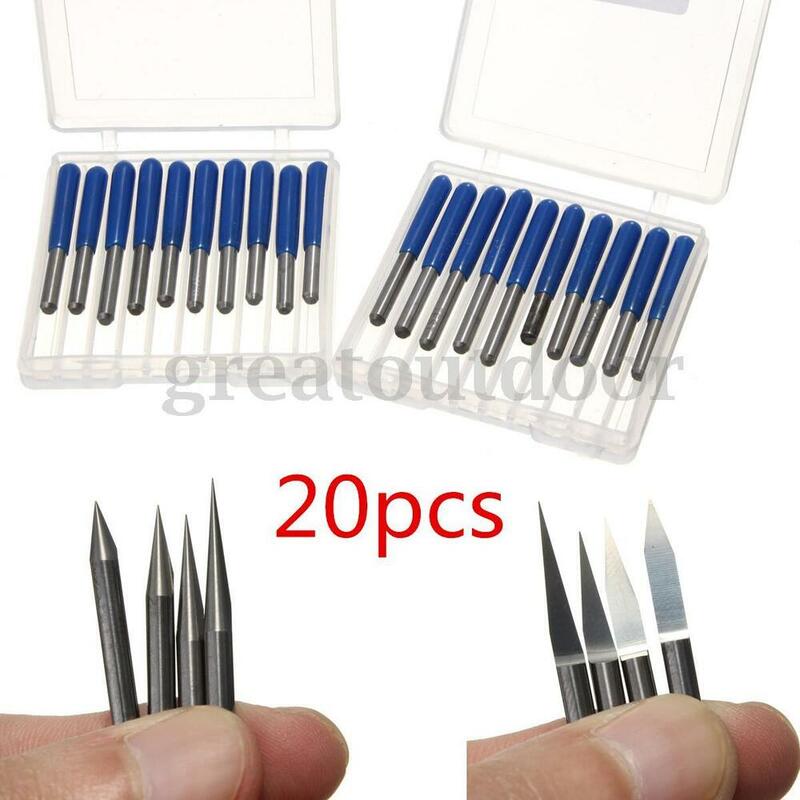 20 x Engraving Bits CNC Router Tools. 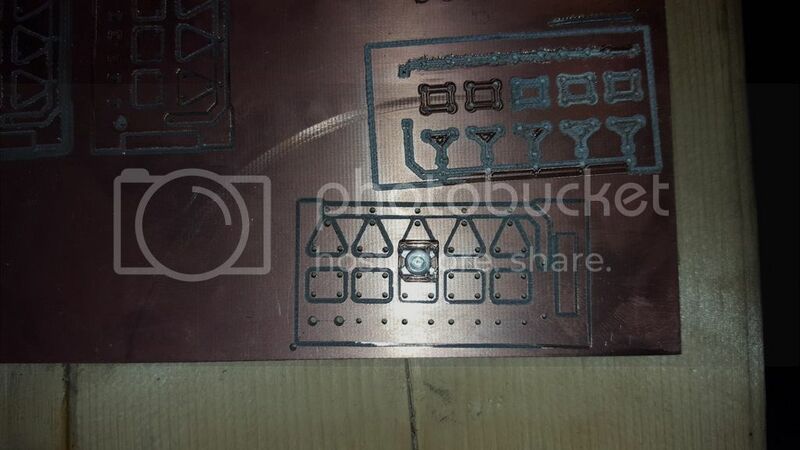 These are mainly used for engraving machine. Material: Hard alloy (tungsten steel). Hard alloy,not easy to be broken. 0.1mmx10°/15°/ 20°/ 30° (5pcs per angle ). | eBay! The board must be perfectly perpendicular with the bit. (Level) If its not you will have major issues. You will need to use a depth gauge to check or you can use a program like Chilipeppr. Its meant for doing PCB and has auto leveling. It has very good support. Its daunting at first but there is a nice tutorial on getting it going. Thanks. I will check/ order then in the next few days. I tryed to do chillipepper. And the website never loaded. I tryed on 3 computers(2 desk and my garage laptop.) None would load. Its why i tryed eagle. I have seen chillipepper mentioned alot. But i couldnt figure out how to get it to work or website to download or if its like easel. Not sure the webpages would not load. SamKnuth - how would one change from one bit to the next without it being offset. if i have to use the drill press to drill holes for the other 3 i will but would like to figure this out. just because it should do it. Hi Sam, I use two techniques for getting precise alignment with bit changes. First, I use an three axis touch plate to re-zero between bit changes. I use this with all my carving. With thin material, you do need to use a half inch of spoil board to raise it high enough off the waste board to use the touch plate. You can mill your own with a few bucks of aluminum and time, or buy one for $50-$70. The wiring is not too bad... you just need to connect one pin from the arduino to the touch plate, then use an alligator clip to connect the bit to ground. The only annoying thing is you have to take off the g-shield to access the pin. CharleyThomas made a great excel spreadsheet that generates the g-code needed to run the calibration. You'll need one script for each different bit diameter you are using. 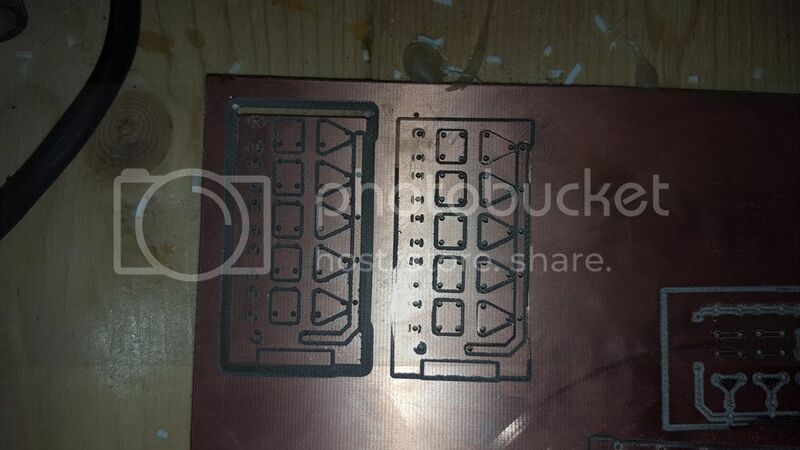 Second, I cut a calibration pattern for drilling into the PCB if I have enough room on the sheet, or I use a piece of scrap off to the edge of the workpiece but using the same zero coordinates. My calibration pattern is just a line of circles cut to the size of my pads, then after the bit change and zero, I run a check to drill out the test pads. This calibration check is done at slow speed, so I can pause the work if the first pad is off, go to zero and tweak my setting, then re-run, watching the result on the next pad (it will re-drill the first, then move to the second, and so on). Before I bought the zero touch plate, I had to use quite a few circles when cutting to tight tolerances, but with the zero touch-plate, I rarely have to tweak anything. For just a few holes, use the drill press unless you want the practice. I would only use this technique if you are producing a lot of boards or a complex board. Did you talk to those guys who make Chilipeppr? Edgar: He is trying to do fine detail with PCB's. .01mm off is huge for miling. This is the reason I suggested Chillipeppr. it can measure in increments the areas of the board so if its off it will adjust the Z value to reflect the difference. PCB boards are not flat. There is a variance and warping. Etching is the easiest way but if you mill you have to use special setup. Another method can be to run the job once and any area that is not deep enough you can create a new file and re-run it again with the edits to remove areas that cut fine. I have done this on other projects to correct engravings on plastic that was not level. Thanks for the clarification. I was given a bunch of PCB boards that are 1.5mm think and clad on both sides. They seem to have some kind of varnish over the copper as well. I've havent tried anything else since I started playing around with electronics for home automation. I must be cutting deep enough to have never encountered a problem with the thickness variance you described. either that or your system is much better than mine on the level. I too have worked with the programming of electronics and created controls for things. Mainly robots. You may want to check out https://www.autoleveller.co.uk/ It alters your g-code so that it follows the contour of the pcb, creating uniform trace cutouts. I use a simple pcb v-bits you can find on ebay and sometimes on amazon. You have to experiment though, I'm not sure it the output g-code is compatible with g-code senders. I use it with mach3.